At IFA 2015, Lenovo unveiled refreshed notebooks from its ThinkPad and IdeaPad lineup complete with Intel's sixth generation Skylake processor. Compared to PCs released just five years ago in 2010, Intel claims that Skylake delivers up to 2.5 times better processor performance, 30 times the graphics improvement and three times better battery life. If you've been holding out on upgrading your ultrabook, laptop or desktop, hopefully Skylake's performance gains will entice you to one of Lenovo's new systems. 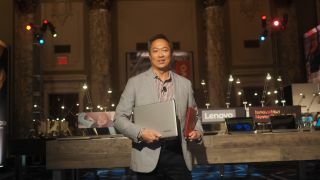 Along with its new laptops, Lenovo is also introducing a redesigned logo and branding. On its consumer laptops, the "L" in the Lenovo logo is now capitalized, but Lenovo is dropping capitalization on its consumer-based ideapad range, which is now in lowercase. Additionally, it is making its models easier to understand. Lenovo is moving towards three-digit series numbers. For example, a 100 series will be an entry-level model with base configurations and a more affordable price. The 300 and 500 series will come with better material selections, upgraded components, and represents Lenovo's more mainstream mid-range lineup. Finally, a 700 series is the top-of-the-line model with even more premium materials and components. The consumer IdeaPad offerings will be available in October. In addition to these laptops, Lenovo also introduced a Surface Pro 3 challenger in the form of the IdeaPad MIIX 700 tablet. The IdeaPad "S" series represents Lenovo's consumer Ultrabook laptops, featuring a thinner design than the non-S series and more premium materials. The Lenovo IdeaPad 100S is available in either an 11.6-inch ($189, £122, AU$264) or 14-inch ($259, £167, AU$362) configurations. The 11.6-inch comes with a quad-core Intel Atom Z3735F processor, while the larger model is equipped with a Celeron N3050 CPU. Both models are available in black, feature a 1,366 x 768-pixel screen resolution, are rated for eight hours of battery life and come with 2GB RAM. The smaller model has two USB 2.0 ports and 32GB storage, while the 14-inch laptop comes with 64GB storage and one USB 3.0, 2 USB 2.0, HDMI port and SD card reader. The 11.6-inch model has a thickness of 0.69 inches (1.75cm) and weighs 2.2 pounds (0.99kg). The 14-inch has a thickness of 0.73 inches (1.85cm) and weighs 3.1 pounds (1.41kg). The IdeaPad 300S ($249, £162, AU$349) and 500S (starting at $499, £325, AU$701) are available in Ebony Black, Platinum Silver or Flamenco Red colors. The IdeaPad 300S comes with an 11-inch screen and quad-core Intel Pentium Braswell N3700 processor, while the more premium 500S is available in 13-, 14- or 15.6-inch FHD screen configurations and can be configured with up to an Intel Skylake Core i7 processor. Both series can be configured with up to Intel's Core i7 Skylake processor, 8GB DDR3 RAM and storage options up to a 1TB hard drive or 256GB SSD. The 300S comes with integrated Intel HD graphics and an Nvidia GeForce 940M 2G discrete GPU, while the 500S can be configured with a GeForce 920M GPU from Nvidia. Battery life is rated at five hours for the 300S and 4.5 hours for the 500S. Both laptops feature Dolby Home Theatre speakers. The 300S comes with a single USB 3.0 port, two USB 2.0 ports, HDMI and an SD card reader. The series starts at 0.77-inch (1.96cm) thick and weighs 3.9 pounds (1.77kg). The 500S comes with two USB 3.0 ports, a single USB 2.0 port, HDMI and a 4-in-1 card reader. The 500S has a starting thickness of 0.76 inches (1.93cm) and weight of 3.4 pounds (1.54kg) for the 13.3-inch model. The IdeaPad 300 and 500 series are Lenovo's mainstream laptops, and they're more affordable than the 300S and 500S counterparts. As such, these models cost slightly cheaper than the comparable "S" models, but come are a little thicker and heavier. The IdeaPad 300 comes in either a 14-inch ($399, £258, AU$559), 15-inch ($549, £355, AU$769) or 17-inch ($449, £291, AU$629) screen configurations, all with FHD resolution. The two smaller models have a thickness of 0.92-inch (2.34cm), but the 14-inch model weighs 4.63 pounds (2.10kg), while the 15-inch model weighs 5.07 pounds (2.30kg). The 17-inch configuration comes in at 0.99 inches (2\.51cm) thick and 6.61 pounds (3kg). Battery life is rated at four hours. The 300 series can be configured with up to an Intel Core i7 Skylake processor, 8GB DDR3 RAM and either 1TB hard drive or 1TB SSHD storage. Users can add an optional integrated optical drive for playing DVDs. In addition to the integrated Intel HD graphics, the 300 series comes with an AMD Radeon R5 M330 GPU. The laptops come with USB 3.0, HDMI, and VGA ports along with a 4-in-1 card reader. The IdeaPad 500 can be configured with either an Intel or AMD processor. The AMD model can be configured with up to an AMD A10-7300 processor, while the Intel model can be equipped with up to an Intel Core i7 Skylake CPU. The AMD model starts at $399 (£258, AU$559) for the 14-inch model and $599 (£399, AU$839) for the 15-inch model. The Intel model starts at $499 (£323, AU$699) and $849 (£550, AU$1,189), respectively. Both notebooks have a thickness of 0.96 inches (2.44cm) and the 14-inch starts at 4.6 pounds (2.09kg), while the 15-inch starts at 5.1 pounds (2.31kg).